Save The Smile – 8th & 9th April, 2017. Home › Latest Happenings › Save The Smile – 8th & 9th April, 2017. We had organised a Volunteers Training Program for parents and concerned individuals who committed themselves to work for Child Safety Education. We had a good turnout of Volunteers who have shown their keen interest to educate themselves to join our fight against Child Abuse. These Volunteers will be mapped with suitable and comfortable roles in our upcoming workshops and spread our mission at their own convenience. 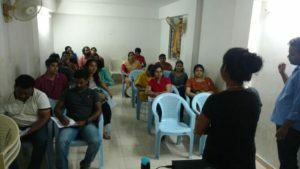 Based on the request from Ceebros, Valasaravakkam – We had organised a Parental Awareness Session on Child Sexual Abuse. We had an equal participation from both Parents and Volunteers. It was an interactive session with mutual learning for all of us. We will be conducting such parental sessions anywhere in Chennai followed with a Children’s Workshop. Please do invite us to conduct one in your gated community or workplace. 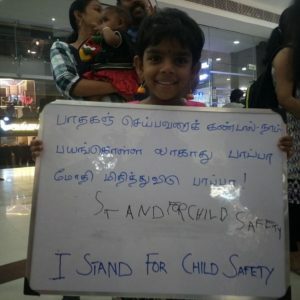 Observing the Child Sexual Abuse Awareness Month, we had organised a Flashmob at Grandmall, Velachery at 7 pm in the evening. 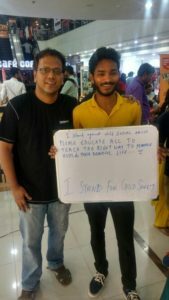 In order to sensitize the general public to know about Child Sexual Abuse, our mission SaveTheSmiles and how they can be a part of it, we had a Flashmob followed with mime performance enacting the scenario of how CSA would happen and how positively we can curb this herrondous crime. We had a great response among the audience especially kids were too proactive in responding to our signature campaign. We requested every onlookers to stand for child safety, pledge for their kids and given them a card with information portals available for CSA. Special thanks to Raack Academy of Dance, TCS Maitree Tapping Toes and Jonny & Team for their wonderful mime performance. Thanks to Aishwarya for coordinating this event throughout. It was a great weekend for Mission SaveTheSmiles.